Commenting on the workshops, Indika de Zoysa, Country Business Manager, Intel EM Limited, Sri Lanka Liaison office said, “Since 2007, Intel Sri Lanka has sponsored 25 students to demonstrate their creativity and innovativeness at the world’s largest pre-college science fair, Intel ISEF. In this short span of time, our students have been able to won five grand awards and seven special awards by competing in this global platform. It is encouraging to see National Science Foundation is currently preparing students for Intel ISEF 2015 through the Science Research Project Competition. I would like to commend their efforts and wish all the students who are now preparing themselves for the final competition. This year, NSF called for research proposals in July and they received 140 applications. 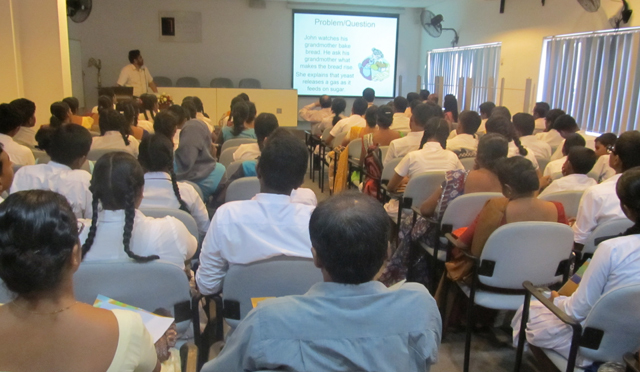 The institute conducted three preliminary workshops in Colombo, Kandy and Vavuniya, to provide guidance for students on how to conduct proper research using research methodologies. Students of age 13- 19 years are eligible to participate at this competition and research projects conducted by school children under any discipline in science are considered. Research projects should be completed within 4-6 months. Group projects and individual projects are accepted for this competition. NSF will provide necessary assistance for the students to conduct their projects at scientific institutions and universities. Out of the 140 submissions, 70 research proposals have been already selected. NSF will conduct two special progress review workshops for these students in Colombo before the final competition falls in December. At the final competition, judges will select the top 10 research proposals and the winners will be selected to participate at the Sri Lanka Science and Engineering Fair (SLSEF). National winners of the SLSEF will get the opportunity to participate at the Intel ISEF. All the participants will be rewarded with a certificate of participation. Winners will be recognized at the World Science Day Schools programme with a cash prize, certificate and a medal. Commenting on NSF’s Science Research Project Competition, NSF Director General, Ms. Anusha Amarasinghe said, “National Science Foundation (NSF) has been nurturing local inventors for many decades. The NSF is mandated to serve science and technology sectors in Sri Lanka and strengthen them to compete in the global arena. The Science Research Projects Competition (SRPC) is a unique concept which helps to enhance analytical skills, ingenuity and innovativeness of school children across the country. The future of Sri Lanka is our school children and NSF believes that it is critical to improve the creative skills and innovative thinking abilities of the next generation. “Over the last few years, NSF has produced some outstanding students with great ideas through SRPC. It was a great opportunity for them to participate at an international competition such as Intel International Science and Engineering Fair (Intel ISEF). From this year’s competition, NSF will select a winner who would be up to the standards competent to compete at the Intel ISEF and NSF expects he or she will represent Sri Lanka honourably. There is no doubt that this student would contribute to the knowledge driven society and economy efficiently and effectively in years to come,” said Ms. Amarasinghe.